Exclusively designed and meticulously crafted just for Lauren’s Hope, the Sloane Hinged Medical ID Bracelet turns on-trend hinge bangles into medical ID jewelry. Hypoallergenic and comfortable to wear, this sterling silver med ID bangle shines with a rose gold tone finish and white inlay. Easy to put on and remove yourself, Sloane features a press-open clasp that just as easily snaps shut with one hand. The front of your Sloane Hinged Medical ID bears the internationally recognized medical caduceus symbol, which alerts Emergency Medical Personnel to your medical information, custom engraved on the inside. 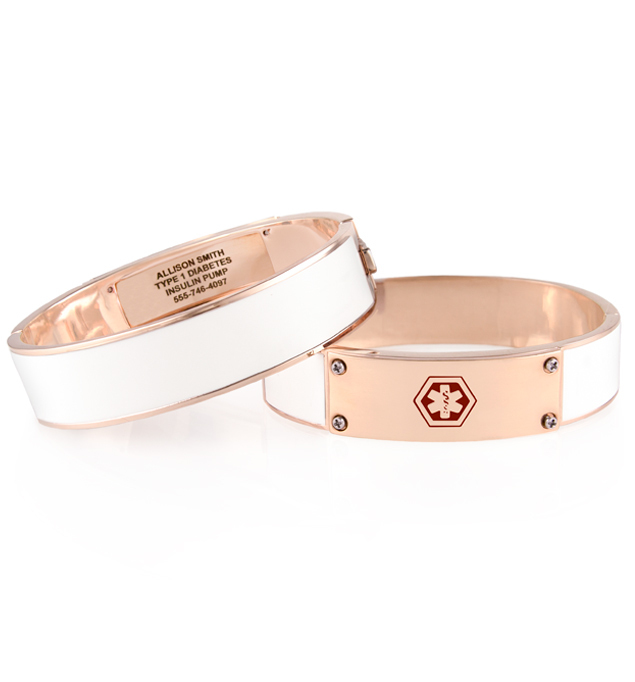 Whether you or your loved ones wear a medical alert bracelet for weight loss surgery, lymphedema or post-mastectomy care, heart conditions, Parkinson’s, or any other medical condition or treatment consideration, med alert hinged bracelets are a terrific option. Hypoallergenic and on-trend, these durable medical ID bracelets are easy to adjust and put on, making them ideal for people experiencing swelling of the extremities, weight fluctuations, or dexterity challenges. This bracelet fits most adults with wrists measuring 6" - 7".